Summer walked away with nary a backward glance and autumn swept in with rain and wind that drove yellowed leaves onto the ground. 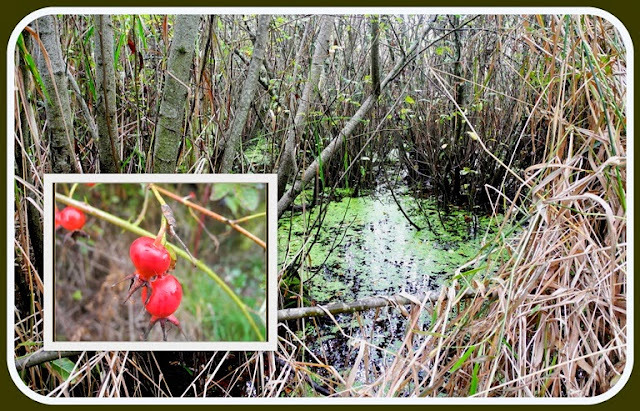 A short halt in the raindrops beguiled us into a walk around Rithet's Bog. Water depths are building and the ducks have returned. Tall yellow grasses, fat round rose hips, and the above berries color the landscape. Would any reader know the name of the above tree/shrub? I've been looking on line without success. edited to add: Thanks to Karen, a friend and reader from Washington State for emailing me yesterday with the suggestion of Hawthorn - yep, that's what they are! Shane from New Zealand also knew what they were. Thanks! Linking to Mosaic Mondayhttp://dearlittleredhouse.blogspot.ca/2013/09/mosaic-monday-red.html, hosted by Mary of the Little Red House. The berry photo is especially nice! I don't know the name though. Have a good week! Nice looking red berries but I have no idea what they are, you likely have different shrubs than us in Ontario. It looks pretty there even in the rain. The berries are a mystery to me too. Happy Fall, Lorrie! Would they be Red Huckleberries?? Could they be what I think is called "choke berries," Lorrie? It is still warm here but next week we are supposed to get our first tsste of autumn weather and then snow won't be far behind! Well Lorrie it looked familiar to me so I googled "Hawthorn berries" and found that is right! The berry looks quite similar to a rose hip. Autumn is a bountiful time when you think of hips, berries and harvesting fruit. The berries are pretty. I am seeing so many different kinds of berries lately. Wishing you a happy day and week ahead! As I love all images of autumn, I find your photos beautiful! Lovely red berries...lovely word pictures too. I thought Hawthorn also...they do grow up here, it's among the one thing that does, lol. And then I got all excited, because I have this mystery shrub that grows on the side of the house, and am always worried that it might be poison oak...it's well vigorous...extremely vigorous. Maybe it needs to be transplanted to the dry garden. Lovely shots today, and your berries are very pretty. I am still enthralled with your dahlia header! Happy fall to you and yours. Ready or not...it is now official! Don't know the kind of berry, but the picture made a pretty mosaic.